Zoo Animals May Live Longer, but Are They Happy? The oldest gorilla in captivity, a 55-year-old named Jenny, died at the Dallas Zoo last week. Zoo officials decided to euthanize Jenny because of an inoperable tumor in her stomach. A zoo spokesperson said she had stopped eating and drinking and tests showed she was unlikely to recover. Even though Jenny was born in the wild, she had lived out most of her life in captivity. Gorillas in the wild normally live to age 35, but they can survive years longer in a zoo, with proper veterinary care and protection from predators, though Jenny’s age was more of the outlier than the rule. 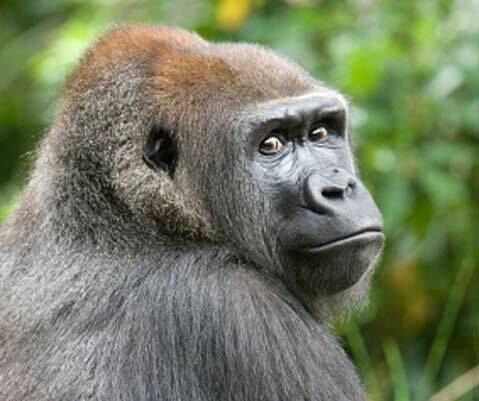 Of the roughly 400 gorillas in North American zoos, only four are more than 50 years old. Even though Jenny lived to be 55, can we make the assumption that her life was better because she lived in captivity? Or did she live in a prison for half a century? I believe it’s more of the latter. It is my opinion that zoos teach people that it is acceptable to keep animals captive for our entertainment. Most animals live in cramped areas where they are bored, lonely, and far from their natural habitats. Zoos claim to educate people and preserve species but they often fall short of this. Most enclosures are a fraction of the size of the animal’s natural habitat and the labels provide little more information than the species’ name, diet, and natural range. The animal’s normal behavior is seldom witnessed because their natural needs are rarely met. The many animals that live in large herds or family groups are often kept alone, or at most, in pairs. Hunting and mating behaviors are virtually eliminated by regulated feeding and breeding regimens. The animals are closely confined, lack privacy, and have little opportunity for mental stimulation or physical exercise, resulting in abnormal behavior. I have personally witnessed many animals in zoos with behavioral disturbances such as pacing, head-bobbing, and self-inflicted wounds. Most zoos claim they are protecting animals from extinction, but zoo officials usually favor exotic or popular animals that draw crowds and neglect less popular species. Most animals housed in zoos are not endangered nor are they being prepared for release into natural habitats. It is nearly impossible to release captive-bred animals into the wild. How zoos acquire their animals is another issue. Many times wild animals are bought from (or sold to) exhibitors, circuses, exotic animal auctions, canned hunting facilities, or zoos not accredited by the American Zoo and Aquarium Association. Often animals are split up from their families to be transferred to other facilities. There are zoos that do their best to encompass an animal’s entire habitat. Visiting the Santa Barbara Zoo, one may come to the conclusion that the animals are better off than in the wild where they face predators and disease. But not all zoos look like the Santa Barbara Zoo. I’ve visited zoos in other parts of the country and in developing nations where the animals could barely walk around due to the confines of their cages. If you aren’t convinced that wild animals shouldn’t be in zoos because of humane reasons, what about safety issues? Wild animals, even when housed in enclosures, are still capable of fatal attacks. The most recent attack was the tragic tiger attack in December at the San Francisco Zoo that killed one person and severely wounded two more. I don’t find it educational to watch wild animals that have been taken out of their biological comfort zone and forced into artificial enclosures, sometimes living on concrete and behind bars. If you want to be educated, I would suggest turning on Animal Planet instead. Zoos are covered under the Federal Animal Welfare Act (AWA), which sets minimal housing and maintenance standards for captive animals. The AWA requires that any wild animal display must be licensed with the U.S. Department of Agriculture, which must inspect once a year. However, some zoos that have passed USDA inspections have later been found by humane groups to have numerous violations. If you visit a zoo and have complaints, start by talking to the zoo management. In some instances, it is more effective to work with, rather than against, zoo management. However, if you notice violations consistently-such as animals in closely confined cages, in enclosures not protected from the weather, signs of abnormal and self-destructive behavior (pacing, circling, and self-mutilation), signs of illness, no access to clean water, and management hasn’t corrected the problem, report the violation to the USDA.